Do you have a camera that used floppy disks? Do you have beautiful memories stored in the floppy disk from decades ago? Do you have a number of stray diskettes that you cannot open them with your computer? Now that many computers do not come with floppy disk drives. Our USB floppy disk drive is perfect solution for accessing information you have on floppy disks. 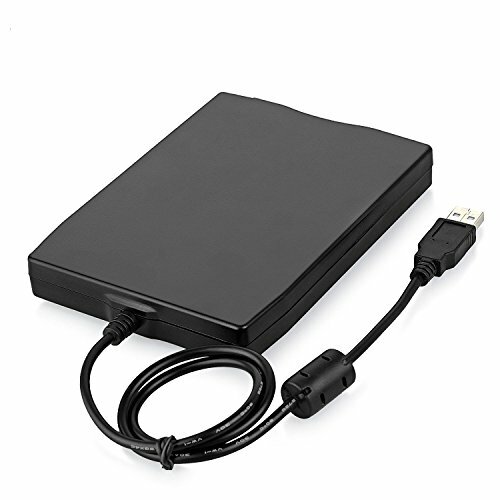 ◆This USB external floppy disk drive is a Ultra Slim external portable floppy disk Drive. Once it is connected to notebooks or PCs, You can view all of information on your floppy disks right now. ◆This super-slim, lightweight and attractive floppy disk drive takes its power requirements from the USB port. No external power adapter required makes this diskette drive fully mobile. ●USB Interface. Plug & Play. USB 1.1/2.0/3.0 compatible. ●Super Slim and light weight, easy to carry. ●USB DATA Transfer Rate: Full speed/12 Mbps. ●Data Transfer Rate:250 Lbits(720KB)/500 Kbits (1.44MB). ●Rotation speed:300 rpm,360 rpm recording method:MFM. ●Available USB Bus supply current: 500 mA or less. ●Operating systems supported: For Windows 2000/XP/Vista/7/8/10,for Mac. For running smoothly,Please plug our external floppy disk drive into rear USB interface of motherboard directly. If you connect our floppy drive through USB hub,USB extension cable or frontal USB interface,it may can not be recognized by your computer since it cannot get sufficient power from your computer. ❤Thank you for choosing our products, if you are not satisfied with which place, please contact us promptly, we will help you solve the problem as soon as possible.  Portable External Floppy Disk Drive,High quality hard plastic enclosure,durable and very nice looking.Super slim and lightweight, easy to carry.  This Floppy Disk Drive will help you rouse old memory from old floppies. Save and transfer all those old pictures,video, documents that you haven't see for ages. It was a life saver which will recover the old data and files on the floppies. This is the best gift for elder.  Get your memory from old floppies,give new life to your old floppies. Ideal for Desktops and Laptops, Support Windows 2000/XP/Vista/7/8/10,for Mac, Notebook,PC,Desktop,for Dell, for Acer, for Sony,for HP etc.  Plug and play, no extra driver required, just plug it into usb connector directly, it will be recognized by your computer and install driver automatically. With interference preventer, effectively prevent the drive from external noise.  Use for industrial machines, aviation tech, ATMS, military and more fields. You can write or transfer data introduced to your industrial machines, ATMS or other device through a floppy drive, convenience for your production .